You there! Hooligan! How much to retweet that tweet about butts in our weekly print periodical? Twenty-five dollars, you say? Sold! At least, that's how we'd like to imagine it went down. Because as more and more traditional newspapers are being forced to shutter their doors in favor of their internet-based brethren, the ones that do remain are faced with a dilemma. How to keep up today's attention-addled youth? Why, tweets, of course. And Reader's Digest is on it. I take issue with this for a few reasons, the first being you asked me years ago to submit jokes for money and didn't take any! I get it. I was terrible. They were terrible jokes. I would pay you NOT to print those. But now I'm an "established" "comedian" who "works" and instead of reaching out to me directly to submit less-terrible jokes for you, my less-terrible work was taken from my Twitter page without notifying or paying me. That's crazy! We went from paying a little bit for terrible ideas to paying nothing for decent ones! That doesn't seem fair. [Y]ou used my Twitter handle in your print magazine without even retweeting the tweet from your account. I know it sounds petty, but that's how Twitter is supposed to work, and your online endorsement would help me get anywhere from 10-12 people to consider my other work. You can't put a hyperlink on a piece of paper, so the odds of someone putting down the magazine, signing in to Twitter, and following me are slim. 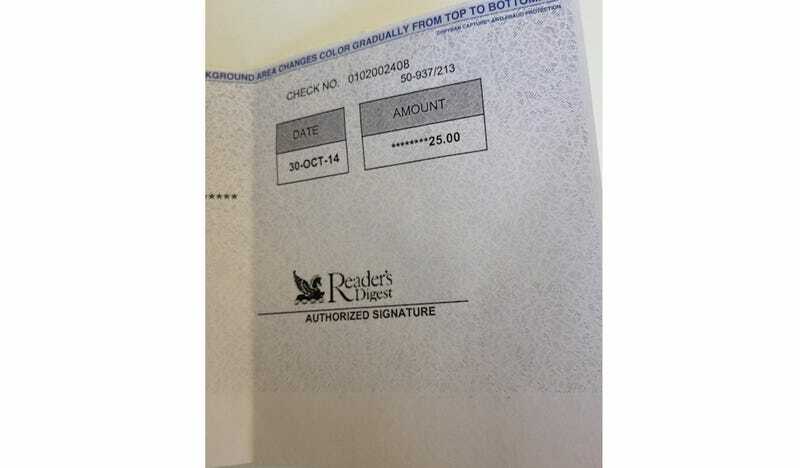 So to make up for any hard feelings and missed followers, Reader's Digest sent him a heart $25 in the mail. But it's not just Dan who Reader's Digest is willing to pay 18 cents (or more) a character to. Apparently, Features Editor Andrew Simmons followed up to let him know that "the magazine would be doing the right thing from now on."